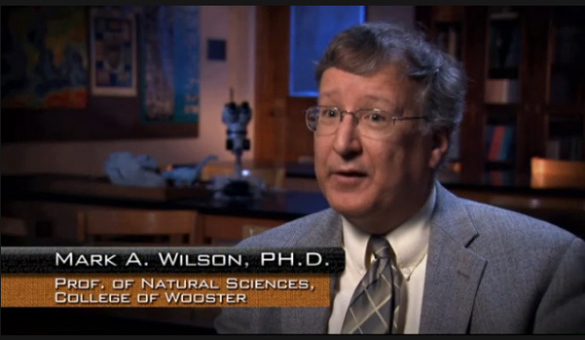 A Wooster Geologist … on TV? 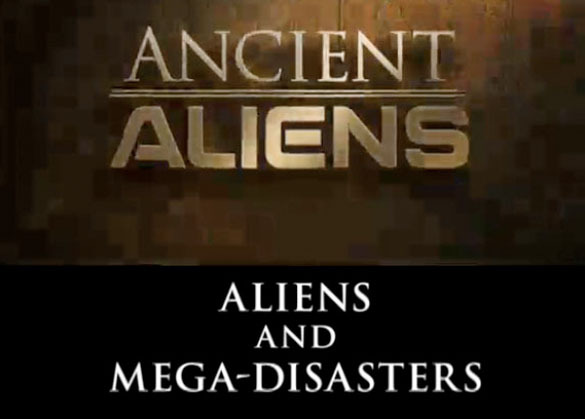 The irony of me appearing for brief moments as a commentator on last night’s episode of Ancient Aliens (“Aliens and Mega-Disasters“) is that I teach a course at Wooster entitled “Nonsense! And Why It’s So Popular“. One of our favorite topics is the American obsession with extraterrestrials, ancient and otherwise. Now I’m actually embedded forever in an episode of this popular pseudoscientific show, and getting there was so much fun. My stint as a TV talking head was not the result of a national talent search for a suave and photogenic geologist — I’d have no chance at that! — but instead through our Director of Public Information, John Finn. He convinced me to let him nominate me for the show after the producer asked if we had any geologists who might want to give it a go. The producer of this episode of Ancient Aliens, who works for Prometheus Entertainment, called me in December 2011 and outlined what she wanted from the “scientific talent”. She was very friendly, honest and frank about the programming, assuring me from the start that I wouldn’t “lose my science card” by participating. She wanted scientists to help frame the scientific issues, naturally, and then she would slot in the “other talent” to present the extraterrestrial angles. She knew very well from my webpages, CV and continual reminders that I am, shall we say politely, not convinced by the evidence for the ancient alien hypothesis. She kept her word, too, and made certain that I and the other scientists in the show did not appear to be lending any support to these speculations. On January 3rd a film crew arrived at the College early in the morning and set up an interview studio in our second-floor teaching laboratory (Scovel 205). They knew just what to do and where because the producer had asked me earlier to send her photographs of likely places for filming. The crew consisted of four men: a lighting expert, a sound man, a guy who helped set up equipment and communicate with headquarters, and a field producer in charge. Watching these men work was fascinating. They love their craft and spent hours making sure everything looked and sounded right. They were so much fun to work with, and they told many stories of other “shoots” they had been on for dozens of other shows. They were all very informed on scientific issues, and they asked me lot of questions just out of curiosity. In the one photo (above) I snapped of the set up process, you can see some of the preparations in the lab, including the many lights, filters and cables. Eventually that whole wall was covered with black-out sheets. 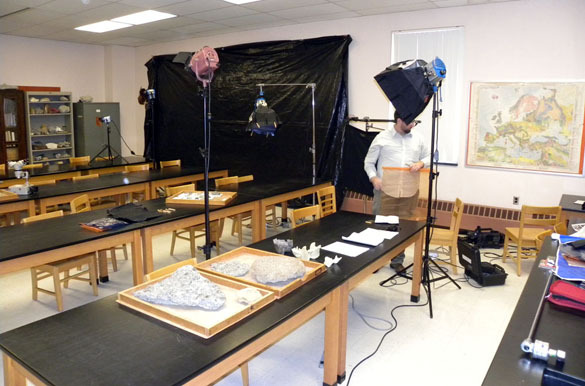 On the tables are trays of fossils for demonstrations and extra footage that may prove useful someday (for what they called “B-roll”). The field producer made sure I signed the various contracts necessary for this work. “Scientific talent” does not get paid on these shows, in case you were wondering, and the exclusive rights to the footage are given to the production company “forever” and “throughout the universe”. After the interview studio was constructed in our lab and the camera set up, the film team sent test shots to Hollywood for their approval. Once it came (and it came quickly), we started the interview. I had been sent a list of questions about a week before the shoot, so I knew the broad outlines of what was coming. The field producer was so good at essentially having a conversation with me about the topics that all my rehearsed answers quickly dropped away. There is some danger in that as a scientist, of course, when you find yourself just glibly talking for hours without notes, but I certainly understand why they don’t just want to record one of our tedious lectures. We just chatted, with my interviewer occasionally reminding me to repeat the question at the start of my answers. He had many of his own ideas and insights, so the process was quite engaging. It is hard to believe now, but at the time I had quickly forgotten about the microphones, camera and hot lights. I suppose this is how reality television works. The interviews, which lasted all day, were recorded on actual film. At the end of the process they bundled up all the film for an overnight express mailing to Hollywood. The film crew deconstructed the interview set-up and returned the lab to exactly its former condition, aided by iPhone photos they made of the room beforehand. You would never know they were there. Last night the results appeared on the History Channel. In the screen-grab above (I tried hard to snap a non-dorky pose but was not successful!) you can see the carefully placed microscope in the background, the backlit door, the posters to fill blank spaces on the walls, and the subtly-lit bookshelves. It really does look like professional television. The episode itself is available here, at least for a short time. Through this adventure I learned a lot about the profession of filming and the integrity of the production crews, and I now have some insights into how an episode of a program like this is constructed. Again, I must emphasize that this whole aliens-came-to-Earth scenario has zero scientific support (and really, alien bases in active volcanoes?). I like to believe, though, that even through this unlikely medium some people out there are receiving the occasional veiled hints of real science.